ANN ARBOR, Mich. — Every week in his clinic at the University of Michigan, neurologist Joseph Corey, M.D., Ph.D., treats patients whose nerves are dying or shrinking due to disease or injury. He sees the pain, the loss of ability and the other effects that nerve-destroying conditions cause – and wishes he could give patients more effective treatments than what’s available, or regenerate their nerves. Then he heads to his research lab at the VA Ann Arbor Healthcare System, where his team is working toward that exact goal. In new research published in several recent papers, Corey and his colleagues from the U-M Medical School, VAAAHS and the University of California, San Francisco report success in developing polymer nanofiber technologies for understanding how nerves form, why they don’t reconnect after injury, and what can be done to prevent or slow damage. 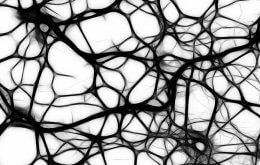 Using polymer nanofibers thinner than human hairs as scaffolds, researchers coaxed a particular type of brain cell to wrap around fibers that mimic the shape and size of nerves found in the body. They’ve even managed to encourage the process of myelination – the formation of a protective coating that guards larger nerve fibers from damage. They began to see multiple concentric layers of the protective substance called myelin start to form, just as they do in the body. Together with the laboratory team of their collaborator Jonah Chan at UCSF, the authors reported the findings in Nature Methods. The research involves oligodendrocytes, which are the supporting actors to neurons — the “stars” of the central nervous system. Without oligodendrocytes, central nervous system neurons can’t effectively transmit the electrical signals that control everything from muscle movement to brain function. Oligodendrocytes are the type of cells typically affected by multiple sclerosis, and loss of myelin is a hallmark of that debilitating disease. The researchers have also determined the optimum diameter for the nanofibers to support this process – giving important new clues to answer the question of why some nerves are myelinated and some aren’t. While they haven’t yet created fully functioning “nerves in a dish,” the researchers believe their work offers a new way to study nerves and test treatment possibilities. Corey, an assistant professor of neurology and biomedical engineering at the U-M Medical School and researcher in the VA Geriatrics Research, Education and Clinical Center, explains that the thin fibers are crucial for the success of the work. The researchers used polystyrene, a common plastic, to make fibers through a technique called electrospinnning. In a recent paper in Materials Science and Engineering C, they discovered new techniques to optimize how fibers made from poly-L-lactide, a biodegradable polymer, can be better aligned to resemble neurons and to guide regenerating nerve cells. They’re also working to determine the factors that make oligodendrocytes attach to the long narrow axons of neurons, and perhaps to start forming myelin sheaths too. By attaching particular molecules to the nanofibers, Corey and his colleagues hope to learn more about what makes this process work — and what makes it go awry, as in diseases caused by poor nerve development. In addition to Corey, the research has been led by Chan, the Rachleff Professor of Neurology at UCSF, VAAAHS lab team member and U-M graduate Samuel J. Tuck, U-M biomedical engineering graduate student Michelle Leach, UCSF’s Stephanie Redmond, Seonook Lee, Synthia Mellon and S.Y. Christin Chong, and Zhang-Qi Feng of U-M Biomedical Engineering. Peripheral nerves, which have neurons at the center surrounded by cells called Schwann cells, can also be studied using the nanofiber technique. The system could also be used to study how different types of cells interact during and after nerve formation. Toward creating new nerves, Corey’s lab has collaborated with R. Keith Duncan, PhD, Associate Professor of Otolaryngology. Published in Biomacromolecules, they found that stem cells are more likely to develop into neurons when they are grown on aligned nanofibers produced in Corey’s lab. They eventually hope to use this approach to build new nerves from stem cells and direct their connections to undamaged parts of the brain and to muscle. 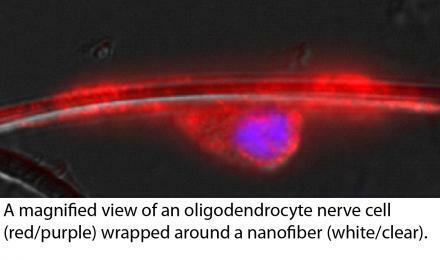 Eventually, Corey envisions, perhaps nerves could be grown along nanofibers in a lab setting and then transferred to patients’ bodies, where the fiber would safely degrade. The research was supported by a VA Merit funding grant, the US National Multiple Sclerosis Society, the Harry Weaver Neuroscience Scholar Award, the Paralyzed Veterans of America and the National Institute of Neurological Disorders and Stroke (NS062796-02). This research is still in the laboratory stages, and there are no immediate plans to perform studies in human patients. If you are interested in finding other opportunities to take part in medical research studies at U-M, please visit http://www.umclinicalstudies.org .